Nashville, TN - August 20, 2013 ... ALABAMA will unveil their new album, ALABAMA & Friends, through an exclusive streaming party on their website from August 20-23, 2013. 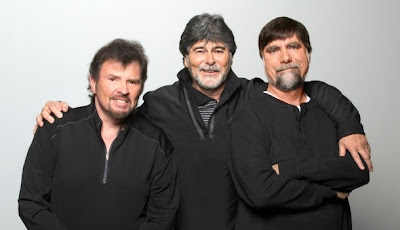 Fans will be able to listen to the entire album before it officially hits streets August 27 by signing up on www.thealabamaband.com. ALABAMA & Friends is in celebration of the band's remarkable 40 years of making music together. The diversity and star power of the artists included on this project speak volumes about the depth of the band's legacy. Contributing their take on some of the group's most memorable hits are Jason Aldean, Luke Bryan, Kenny Chesney, Eli Young Band, Florida Georgia Line, Jamey Johnson, Toby Keith, Rascal Flatts and Trisha Yearwood. The project also includes two brand new songs from ALABAMA, their first new music in more than a decade. The new album has already become another success, making an impressive debut among the Top 5 country albums on iTunes, just days after ALABAMA & Friends was available for pre-order on the popular digital retailer. ALABAMA became a household name after signing with RCA in 1980 and with their stratospheric accomplishments that soon followed. During the '80s and '90s, they outsold every artist in all music genres. They have scored an amazing 43 No. 1 hits throughout their illustrious career and sold more than 73 million albums worldwide. They have also won more than 150 major industry awards, including trophies from the Grammys, CMA, ACM and countless others. The Hall of Famers have earned 21 Gold, Platinum and Multi-Platinum albums, and were named the RIAA's Country Group of the Century.